You enter the park directly in your garden by car, to the terrace in front of your cottage. You enter a large open room on two facades bathed in light south. This great -private living room on which opens a kitchen, a space to access the toilet and closet space, and access to the floor staircase. Upstairs, a large corridor serves the south-facing 3 rooms overlooking quiet garden, and a bathroom in the old style, with bath, washing machine and dryer, separate toilet. You descend on the terrace in the afternoon for a drink in the lounge chairs in the sun and in the evening a nice dinner assets installed in the teak garden furniture. Day, children can play in the sandbox, swing on the swings of the portico, or dive into the pool under the watchful eye of top rooms that overlook the garden. You are guaranteed a great time! Come taste and enjoy this great house between Dombes Burgundy and Beaujolais, there at the Castle Avaneins - Charming and quiet valley in Saône -Your family lives in a castle life. Clévacances label gite 4 keys. This 18th century property offers you a relaxing stay in the castle itself, surrounded by a warm and quiet nature, where you can relax in the large private park (gite closed castle) with its in-ground pool (closed castle) , make beautiful walks in the revivifying countryside, enjoy the nearby leisure park, go hiking the greenway, the vineyards of Beaujolais and Burgundy, the Dombes ponds, ornithological park, visit the cultural or spiritual highlights , in this region so rich in its history. your stay is in this property, 35 km north of Lyon, between the three departments of the Rhone, Ain and Saone et Loire, to enjoy this haven of peace. (Litteries & towels installed). All seasons: 110-140 m² - 6-8 persons - 3-5 rooms - exclusive swimming pool - Garden - porch - children's games - against the Beaujolais and Burgundy. Welkom in "Castle Avaneins" een groot landhuis in of vallei van de Saone Dombes tussen of Burgundy Beaujolais waar charm of rust kernwoorden zijn voor een heerlijke vakantie voor uw u familie. In dit is een 18th eeuwse landhuis geheel u beschikbaar voor Onafhankelijke vleugel, omringd door mooie natuur puts toegang tot een private park prachtig met een zwembad. Slechts 35 km ten noorden van Lyon, "Castle Avaneins" biedt een makkelijke toegang tot drie Departementen van de Rhone, Saone in Ain et Loire. Een omgeving met veel te zien in te doen! Van schitterende wandelingen in of natuur, van Wijngaarden of Beaujolais in Burgundy, in meren Dombes, het Vogelpark, tot authentieke dorpjes in steden flight puts historie. Genieten haven in een van rust. Alle seizoenen: 140 m2, 6-8 personen, 3-5 slaapkamers, private zwembad, tuin, kinder speelgoed. Lakens in handdoeken voorzien. Wonderful Chateau Deep in the Wine Country! Could not have enjoyed this place more! It is deep in the countryside, but is still very close to restaurants and countless vineyards. We had a wonderful time, including a wine-tasting in a local vineyard that would not have taken place without the personal assistance of the proprietress. 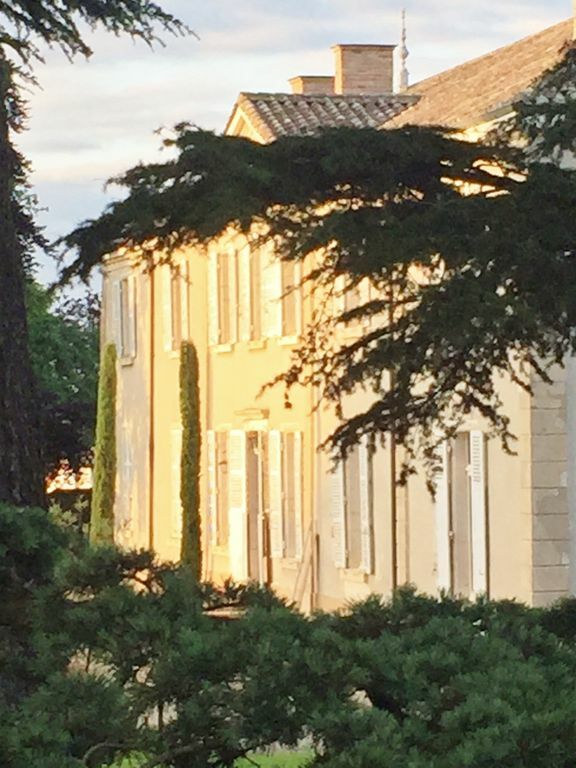 Great dinners, amazing wine, and peaceful walks in the French countryside made this a great stay! Lovely, quiet gîte in beautiful surroundings and the hosts were helpful and charming. We had a wonderful week staying here. A lovely place and the hosts were extremely nice and helpful. Great facilities and a nice, quiet and beautiful location. Close enough to Lyon to enjoy a few great day trips there. Recommended. Wir haben unseren Aufenthalt im Clos du Château sehr genossen, vor allem die Ruhe und der grosse Park sind einmalig. Der Empfang des Vermieters war sehr charmant. Allerdings sollte man Hunde lieben, denn "der Herr des Hauses" ist immer präsent. Wir hatten Freude an diesem Hund auf Zeit, auch wenn er den Park mit einem teilt. Bei einem Schloss in dieser Grösse und Alter ist nicht alles perfekt, die Zimmer sind zwar sehr schön renoviert und geschmackvoll eingerichtet, aber fertig ist nie alles. So fehlte leider z.B. das erwähnte 2. WC, was nicht mit der Beschreibung übereinstimmt. Trotzdem werden wir unsere Ferien in bester Erinnerung behalten. Un excellent week-end en famille dans un appartement du chateau. Très confortable et décoré avec finesse. Le parc est remarquable, il le sera encore plus dans quelques semaines. Les propriétaires sont très agréables et attentionnés. Nous avons résidé auc chateau des avaneins en mai 2014. L'endroit est parfait pour une famille, les chambres sont grandes avec une très bonne literie, la cuisine très bien équipée et le salon permet de se détendre ou de manger. A cela s'ajoute un très grand jardin qui est dédié au locataire avec plusieurs équipements pour les enfants (bac à sable, balançoiire) bref idéal pour les occuper. L'été une piscine est disponible. L'accueil est chaleureux et les propriétaires très avenants, n"hésitant pas à vous aider tout au long du séjour ce qui est vraiment appréciable. Le gîte est situé au frontiére du beaujolais, pas très loin d'un parc animalier et au coeur de la nature. Nous avons pu visiter pendant toute une semaine toutes les merveilles de cette région. Un endroit que nous conseillons.